The alarm clock was ringing early today. 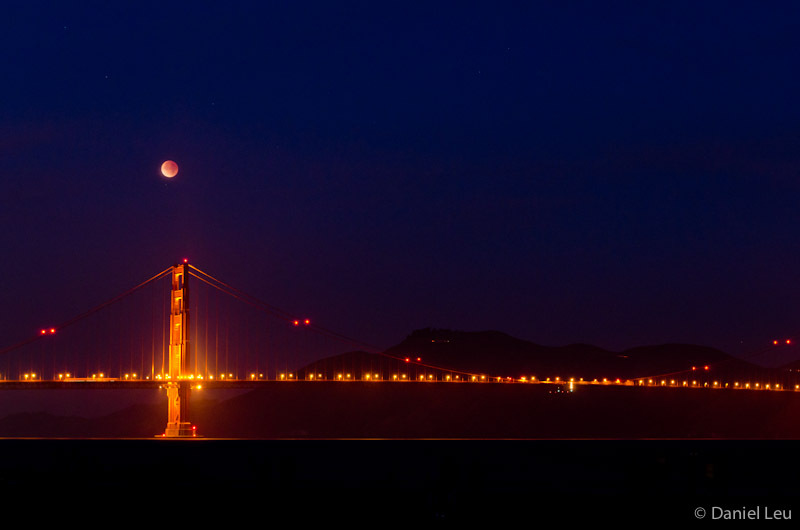 The plan was to shoot the Lunar Eclipse over Golden Gate Bridge. For once, we were lucky since there was no fog covering the bay and the bridge. Initially, it was still very dark and, although the lunar eclipse was already in full swing, the moon was still too bright. Eventually, the upcoming sun rise started to brighten the sky and the contrast between the moon and the sky decreased. So now the red moon is glowing. 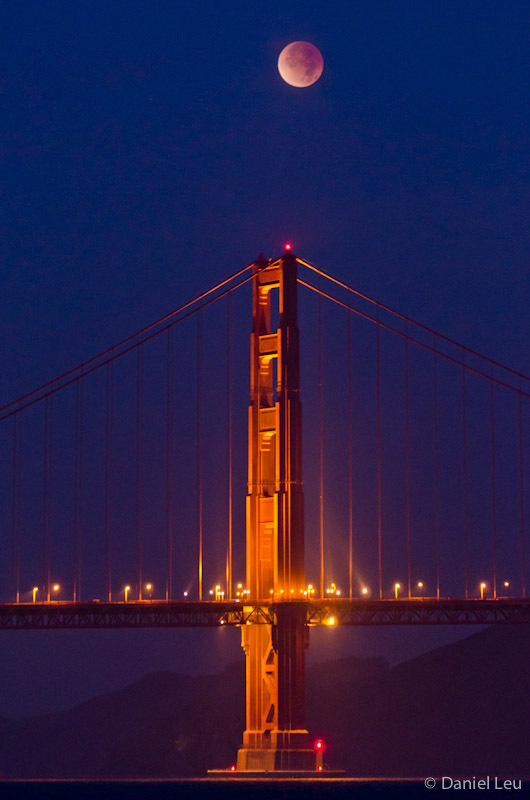 We are pleased here in San Francisco to have many photogenic object such as the Golden Gate Bridge. Would be nice to see an eclipse more often. But then it wouldn’t be that special anymore. I am already looking forward to the next one! 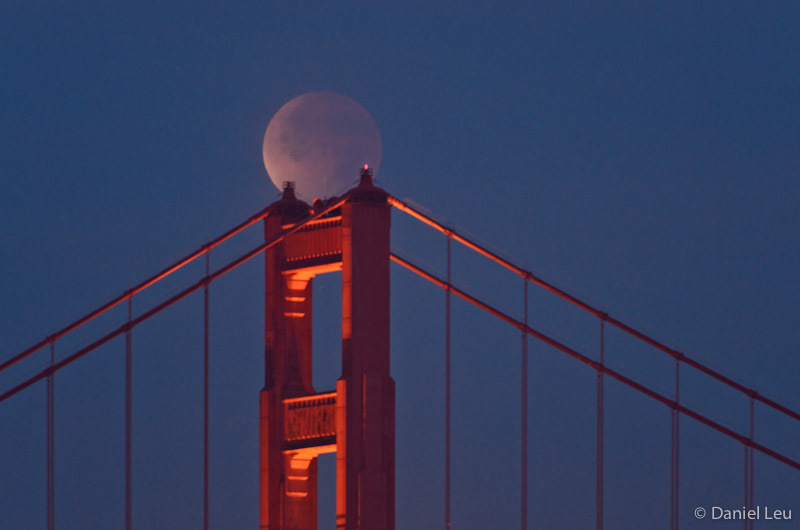 And then the moon ‘touched’ the bridge. Yeah, it was worthwhile to get up that early. Thank you, Steven. Sorry, I missed your question. I used TPE (http://photoephemeris.com/) to get an idea of where to shoot the moon. 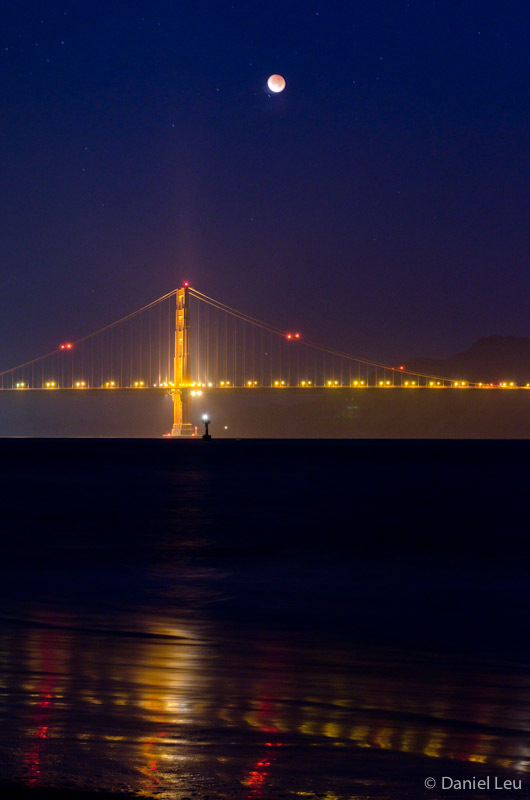 So Crissy Field with the Golden Gate Bridge was kind of obvious. In the end I joined a photowalk organized by Frederic Larson. But thanks to your blog, I learned a lot about shooting the annular solar eclipse and where to get solar filters from! Thank you! Hey Daniel. Great images. Just curious where you learned about this location / event. Was it from BLOG.StarCircleAcademy.com, the SF Chronicle Online or elsewhere? I saw you posted this on Michael Frye’s blog so I had to check out your eclipse. Those were great, Daniel! Thank you for your kind words! It was a great experience to see the eclipse. Great shot! Best I have seen for this eclipse. It’s not so much about just capturing the moon in eclipse, as it is getting it in an interesting setting. You’ve succeed in both!